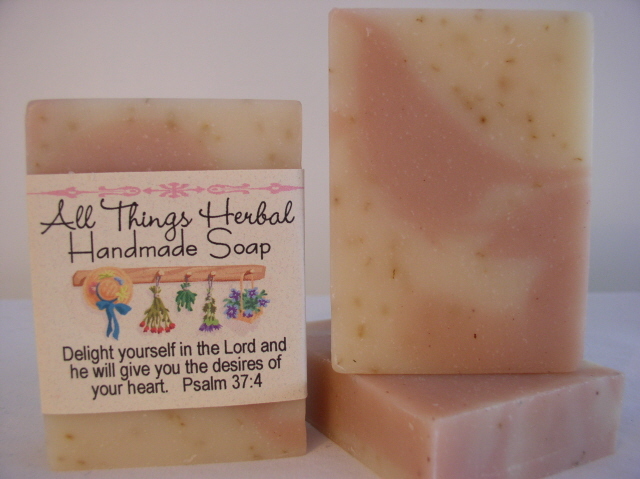 Taking a few of our favorite herbal soaps, we turned them into Inspirational Soaps - handmade soaps featuring verses from scripture. 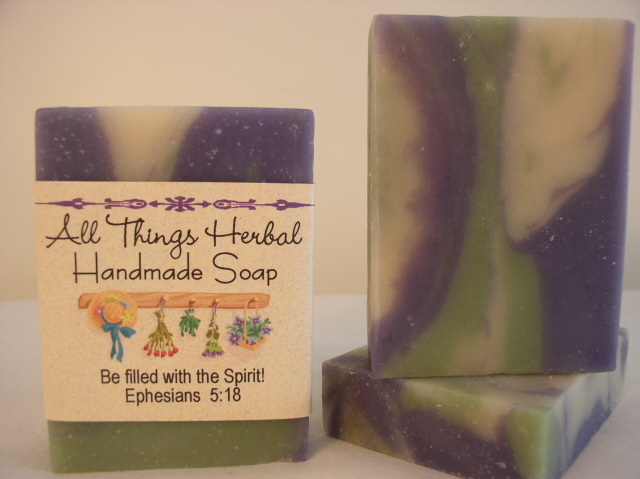 These soaps make a unique and beautiful gift or favor at weddings, baptisms, confirmations, graduations, reunions, anniversaries, recognition programs and more. Looking for a specific quote? 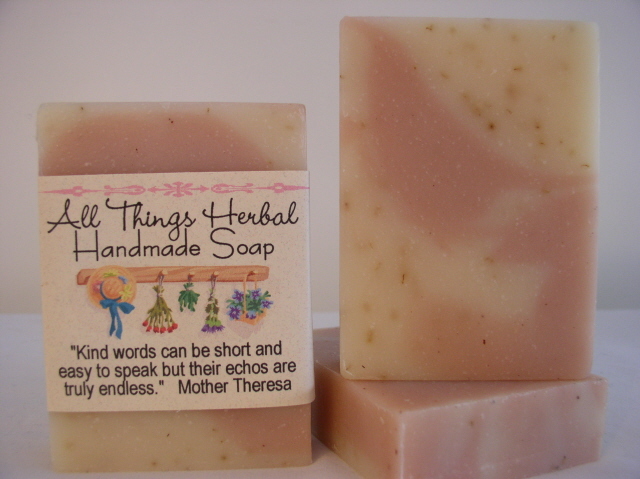 We'd love to custom label a soap for you - just write what you'd like in the memo box during check-out. Take the time to make a difference in the lives of others with a kind word. 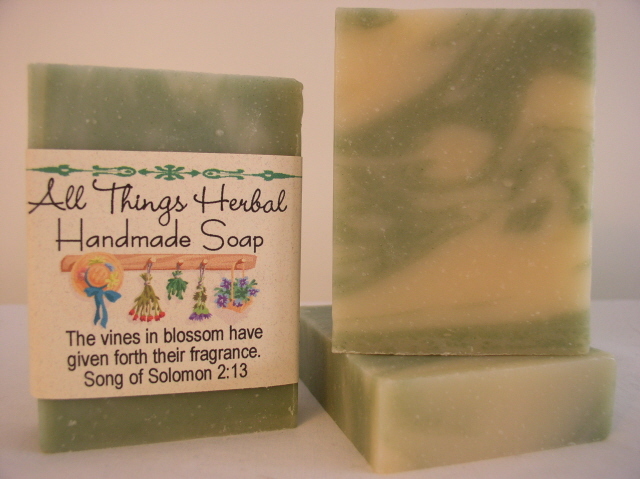 Simple Ingredients, Extraordinary Benefits: Cold-process soap made with moisturizing oils you and your skin will love, saponified olive, palm, cocoa butter, shea butter, sunflower and coconut oils, rose kaolin clay, red clover tea. 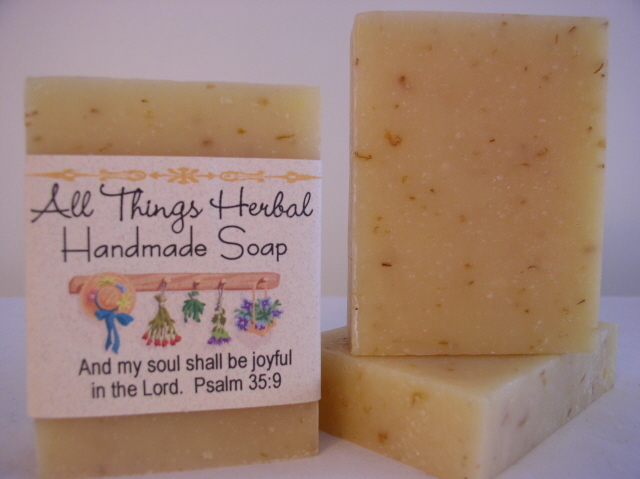 Simple Ingredients, Extraordinary Benefits: Cold-process soap made with moisturizing oils you and your skin will love, saponified olive, palm, cocoa butter, shea butter, sunflower and coconut oils, fragrance, herbs, mineral colorant. 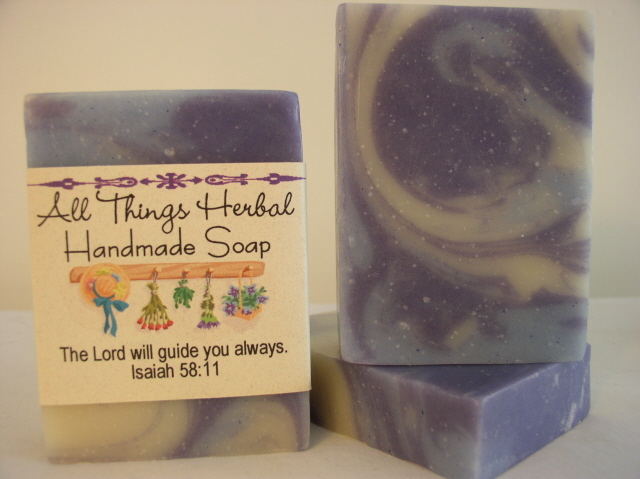 Simple Ingredients, Extraordinary Benefits: Cold-process soap made with moisturizing oils you and your skin will love, saponified olive, palm, cocoa butter, shea butter, sunflower and coconut oils, fragrance, mineral colorant. 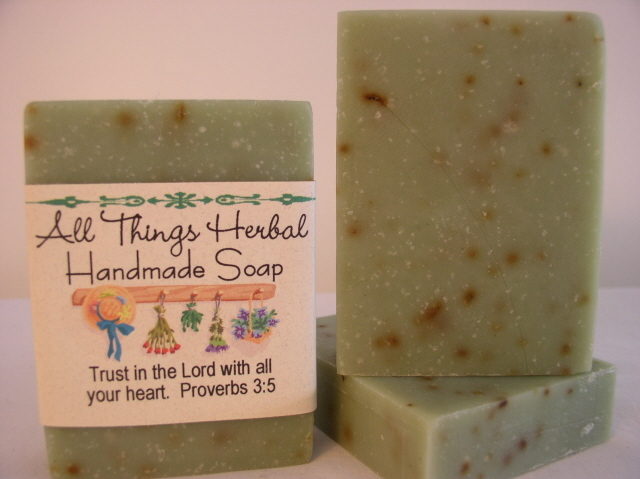 Simple Ingredients, Extraordinary Benefits: Cold-process soap made with moisturizing oils you and your skin will love, saponified olive, palm, cocoa butter, shea butter, sunflower and coconut oils, fragrance, mineral color, French green clay. 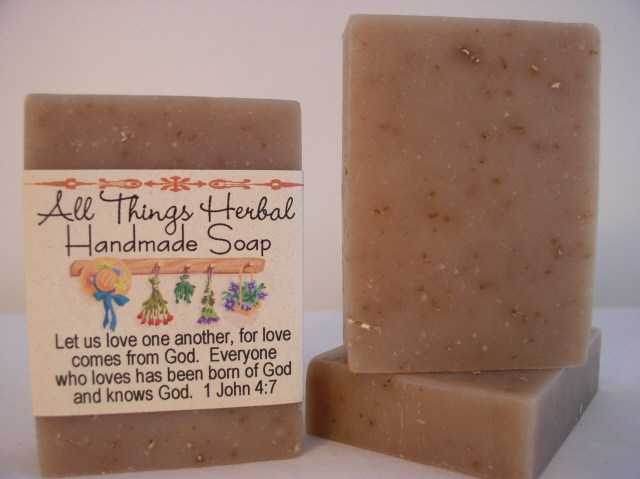 Simple Ingredients, Extraordinary Benefits: Cold-process soap made with moisturizing oils you and your skin will love, saponified olive, palm, cocoa butter, shea butter, sunflower and coconut oils, scent, cinnamon powder, oatmeal. 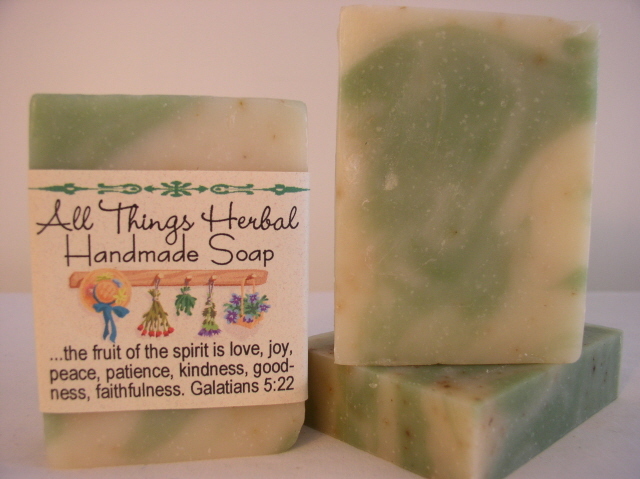 Simple Ingredients, Extraordinary Benefits: Cold-process soap made with moisturizing oils you and your skin will love, saponified olive, palm, cocoa butter, shea butter, sunflower and coconut oils, peppermint and spearmint essential oils, mint leaves, French green clay. And my soul shall be joyful in the Lord. 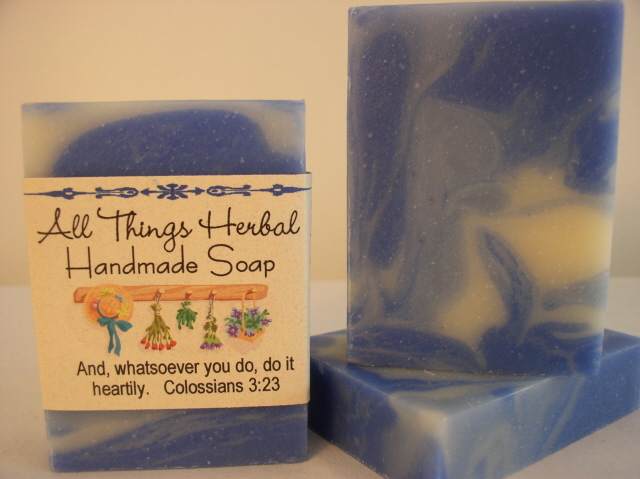 Simple Ingredients, Extraordinary Benefits: Cold-process soap made with moisturizing oils you and your skin will love, saponified olive, palm, cocoa butter, shea butter, sunflower and coconut oils, lemongrass and litsea essential oils, calendula petals. 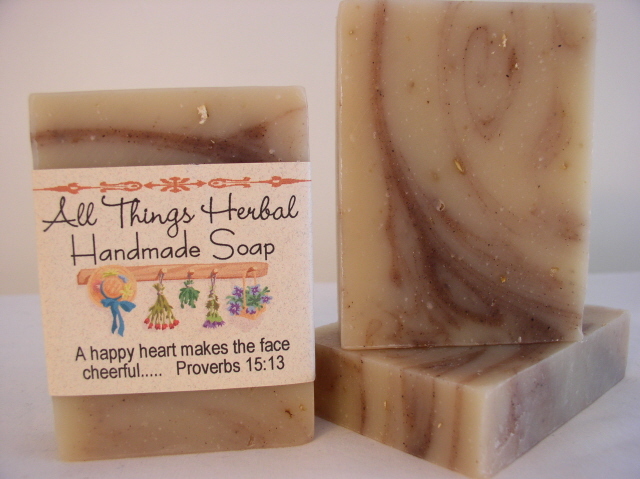 Simple Ingredients, Extraordinary Benefits: Cold-process soap made with moisturizing oils you and your skin will love, saponified olive, palm, cocoa butter, shea butter, sunflower and coconut oils, oatmeal, almond fragrance and bitter almond essential oil. 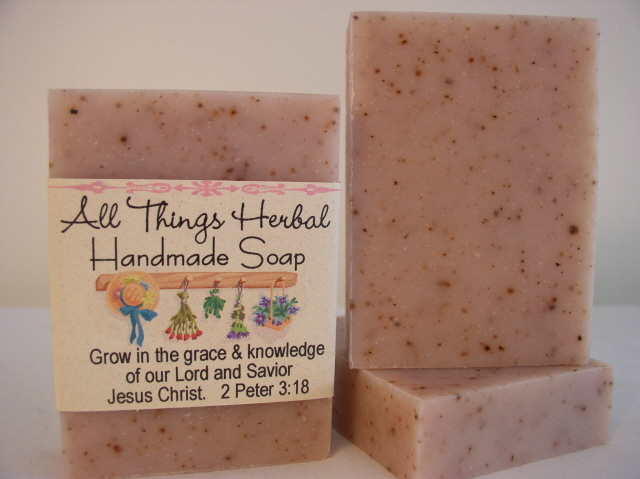 Simple Ingredients, Extraordinary Benefits: Cold-process soap made with moisturizing oils you and your skin will love, saponified olive, palm, cocoa butter, shea butter, sunflower and coconut oils, rose kaolin clay, powdered rosehips, rose geranium and palmarosa essential oils.